Gold severum cichlids are a native of South America. They are also known as Hero Cichlids or Banded gold severuCichlids. They are of the larger types of cichlids and can grow up to 20cm in length. Male and female gold severum cichlids basically have the same color although the females appear to be paler than the males. The only other difference in their color is that the females do not have the same pattern on their heads as the males. Baby cichlids will have clearer patterns on their bodies. These patterns consist of 7 to 8 stripes on their bodies. By the time these baby cichlids mature, these patterns will not be as visible and my even reach a point where only bar will only be clearly visible. To make these cichlids happy, you'll need to keep them in a big enough aquarium. 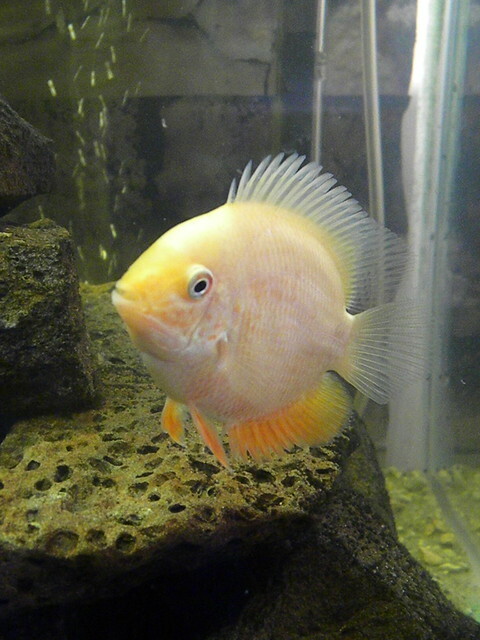 To keep gold severum cichlids on a proper diet, make sure you feed them enough vegetables which means sticking to their natural diet as much as possible although this type of cichlid will eat almost anything. These cichlids are generally mild-mannered and shy and will mix with active fishes of the same size and habits as itself. The water temperature that is right for the cichlids should be kept between 72F to 79F. Although these cichlids are shy in nature, when it comes to breeding they are pretty aggressive and because of this nature, it is best to set up a separate tank especially for your breeding gold severum cichlids. The initial breeding process will take some time though as these cichlids are known for being picky when it comes to choosing their breeding partners. Gold severum cichlid broods can be as large as containing 1000 eggs at each spawn.